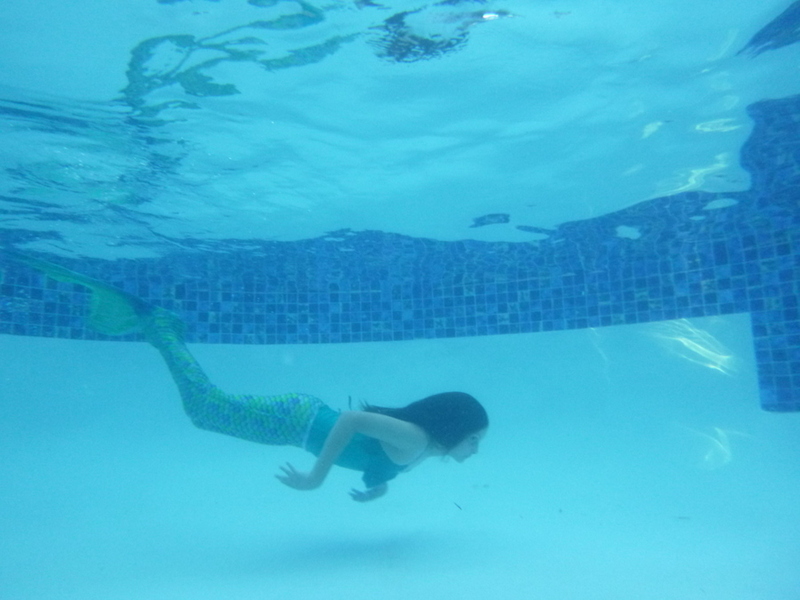 My friend Cath posted a picture of her girls playing in gorgeous mermaid tails in a pool, and it looked like so much fun. 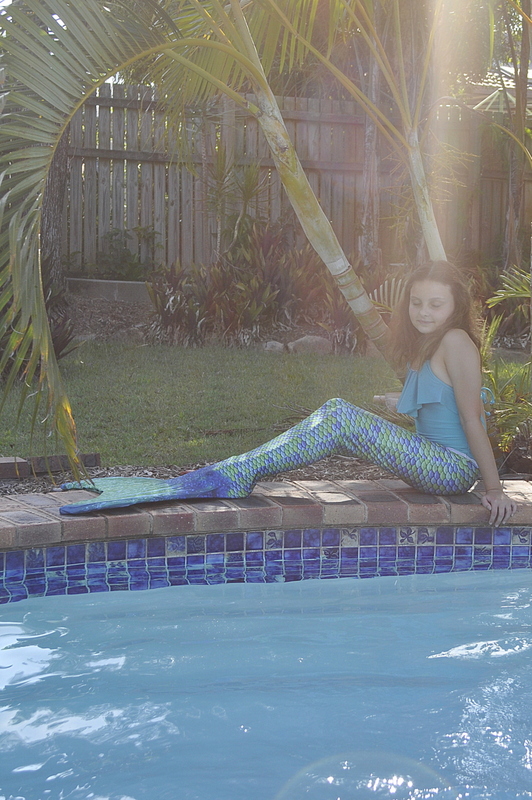 I hadn’t seen mermaid tails quite like it before for children. The only fins I have seen in the shops are the flipper tail style which received bad press after a scare with a child struggling to swim to the surface while using the product. These tails are not the same. Since it was coming up to my daughter’s birthday, I ordered a tail and they are absolutely gorgeous and so realistic! 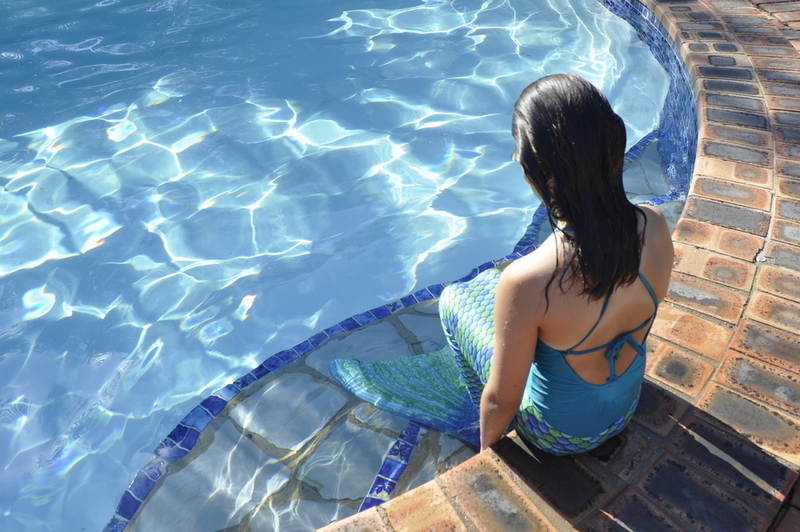 I loved playing mermaid games in the pool when I was a kid and I would have LOVED one of these! So special. 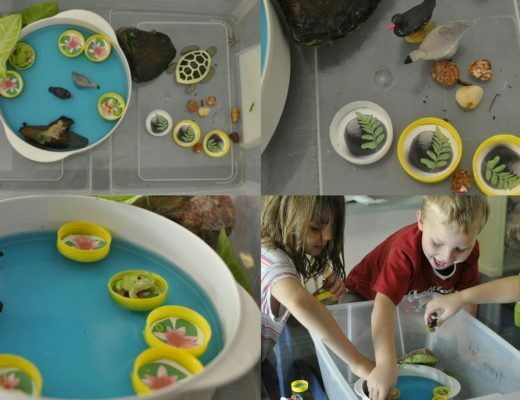 The company that sells them is called FinFun AND the tails come in a range of sizes, adult sizes too. 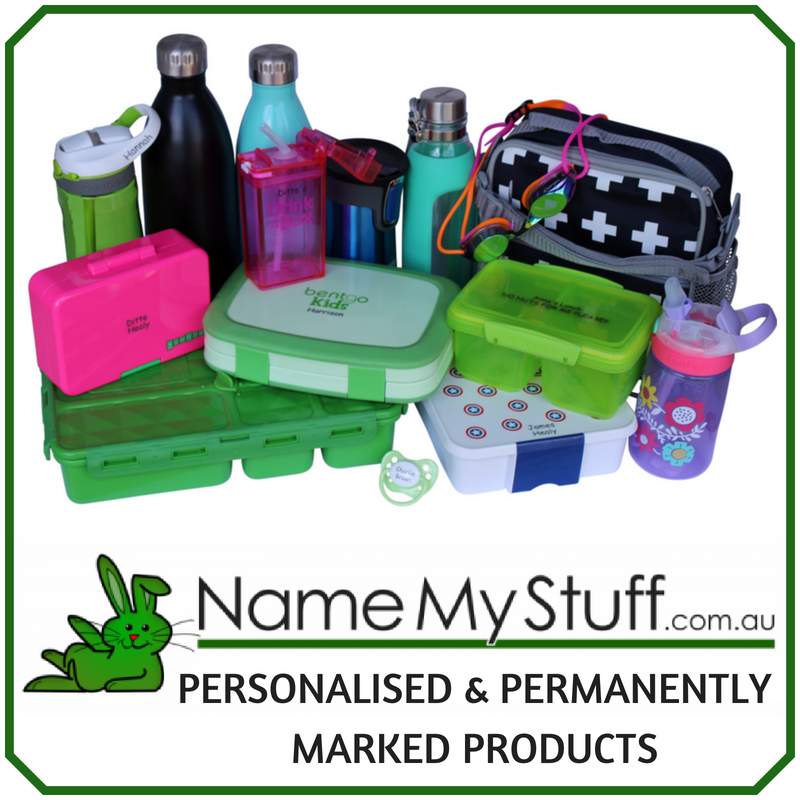 The company is based in America, however there are limited colours available directly from the Australia shop. I ended up buying from America because it worked out to be cheaper. This cost about $130 for both, and then an extra $25 for postage (cheap for postage from USA), so they are quite expensive. However, when I was thinking about it, if you broke it down into….flippers for say $40 or $50, and then the high quality fabric (that would be about the same as three pairs of swimmers), I can see where the costs go. After a month of use, the tail still looks perfect…so, so far, so good! 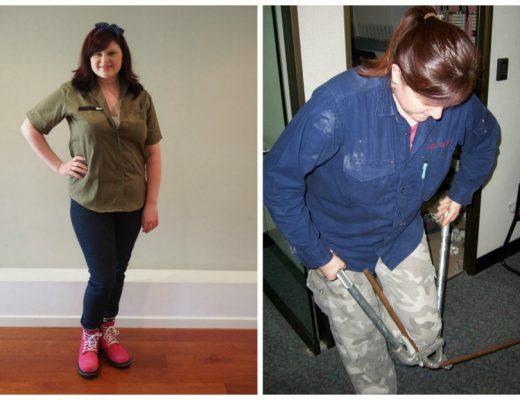 My daughter is wearing Zoey’s Aussie Green, which is the style pictured first below. The colours are lovely in real life and there are a lot of different styles available. Swimmers are the Kaiami brand from City Beach. Sizing is always a bit tricky when you’re buying online, however I used the online guide to help and the size of the tail is perfect. My daughter is a size 10-12 in children, and we went with a size Youth 12 for the tail. The monofin that fits the tail size I selected is a Monofin PRO (which is from size Youth 12 to adults). For sizes smaller sizes, 6-10), Monofin JR will fit. Safety is always of paramount concern, and my daughter and I went through the safety information on the website together, and I supervised closely as she tried it out in the pool. My daughter practiced close to the side of the pool before swimming, and she also tested how to get out of the tail in the shallow end of the pool. To remove the tail at any time, you just pull one foot out of the fin (just lift up a leg), then the other leg, and then it’s a simple matter of pulling the tail down. It’s easy and comes off simply. My daughter has been using the fin for over a month now, and there’s been no problems at all; however I do feel close supervision is important with pool play in general. To see the tail in action, right from the putting on stage and swimming around to removing the fin, my daughter demonstrates in this video. 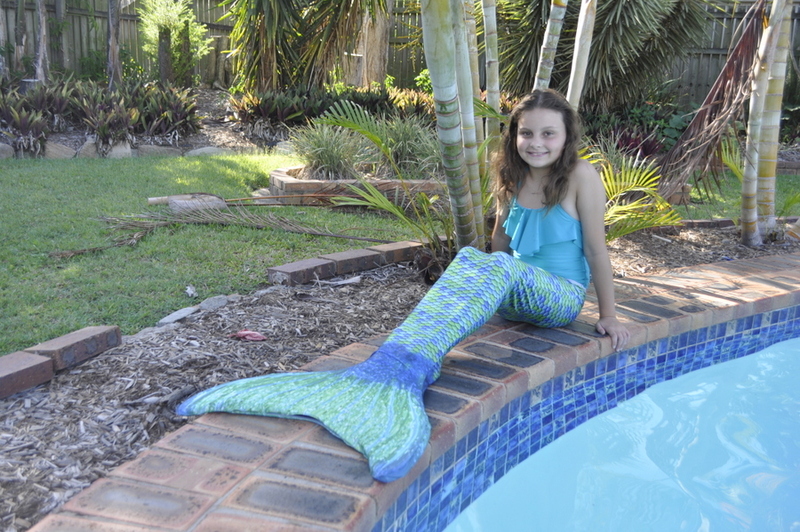 If you have a mermaid fan at your place, these tails are simply gorgeous. Thanks Monika. It’s great to have those links to read so others can make an informed decision. I was aware of the reported dangers, yes, and I agree with the articles that younger kids would especially be at risk and supervision is imperative (for all children). 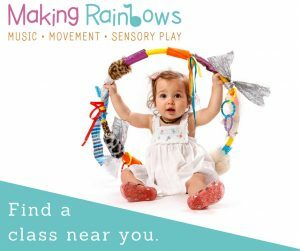 Personally, we have gone through careful considerations in terms of safety, and we feel comfortable for our children who use it, who are between the ages of 11 and 16. However, it is one of those products that needs careful consideration and those links are useful and I appreciate you sharing them here. 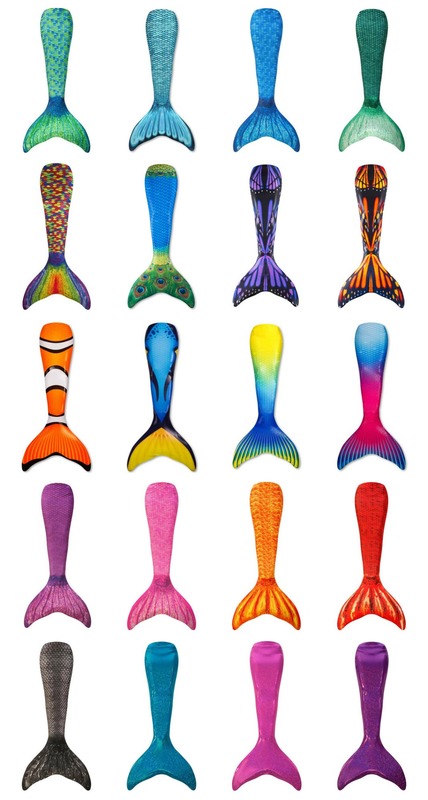 I want to order a mermaid tail and fin please.